Knowing the down command keeps your dog out of trouble and safe from harm particularly when they are a short distance away from you. Down is also a very useful command if you have a dog who is fearful. as when dogs lie down they are automatically more relaxed, submissive and respectful. 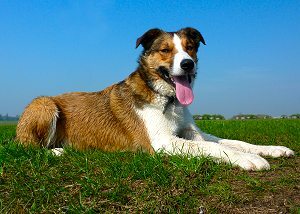 The ultimate aim is to get your dog to go immediately in the down position when you command and wait in that position for the next command. To get to this page it does take a lot of practise and patience. Training the down position comes easier to some dogs than others. It is important to keep the training session short and once you start to teach it, work on practising it frequently, several times a day minimum. As always its best to start off in a quiet place with no distractions. Place your dog in a sit position and kneel down in front of it. Hold a nice smelly tasty treat between your thumb and forefinger in front of your dogs' nose but don’t let it take it. Say down and move your hand straight down towards the ground right in front of your dog and it dog should follow your hand. Gently encourage and praise your dog and when the head is down close to the floor give it the treat. Repeat a few times and progress to moving the treat a bit further away to encourage your dogs legs forward. You will need to repeat this action several times, slowly moving the treat further in front and eventually your dogs's belly should go down on the floor with its' feet out in front. When your dog gets to this say Yes, give lots of praise and reward. But don’t let your dog get up until you have given it your “release” command. If your dog does not go down and lifts its bum off the ground to stand, then start off again with the sit position. This time move your hand with the treat to the floor and put your other hand gently on his back, this will help to prevent your dog from standing, do not push your dog down. If you are having difficulty getting a puppy to go into the down position, an alternative way to teach it, is to sit on the floor and have one leg raised and bent at knee so you create a gap just large enough for the puppy to go under. With a treat in your hand encourage your puppy to move under your leg and lie down. When it does, praise, treat and reward it. Repeat this several times over several training sessions and gradually move your leg away when you feel your puppy is getting the hang of it. Once you feel your dog has an understanding of what down mean you should add in a hand signal. My hand signal for down is holding my arm out in front of body, fingers together, palm facing downwards and a firm downwards movement of the arm. Practice the down position daily in as many different environments and circumstances as you can. Get your dog to go down further and further away from you, this is where the hand signal becomes essential. Note that it is important that when you put your dog in the down position it must remain there until you give your “release” command. Therefore once your dog knows down, practice it with adding in the stay command. Slowly practice “down” in different environments and when you are out and about on your walks.